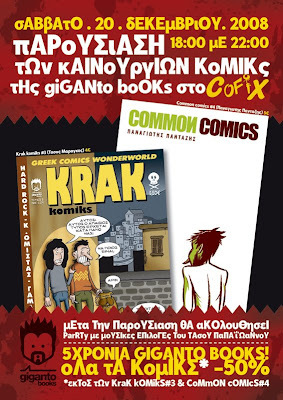 This Saturday, at Cofix cafe/bar in Thessaloniki (a comic fan's hangout at Lori Margariti 11, tel 2310 250 011), for the first time in our city, Giganto Comics (my dear friend Tassos Papaioannou) will present their two newest editions, Common Comics #4 (by another dear friend, Panagiotis Pantazis ) and Krak (by talented local boy Tassos Maragkos). It starts at 18:00 and, after the presentation, T-drom will kindly grace us with his music selections as DJ! All Giganto comics will be sold there at 50% discount (great ideas for Christmas gifts!) and the two new ones will also be sold at discount. Giganto is celebrating 5 years of comics so this is kind of special and it makes me very happy to have these talented people here! Be there or be square!